Here are some other reasons – mostly misconceptions – why some people don’t recycle grass clippings. Clippings that lay on top of a lawn are ugly. Clippings can smother a lawn, especially when the mower spreads the clippings unevenly. Clippings can accumulate and cause thatch buildup. Clippings from lawns adjacent to a pool can be tracked into the water. Admittedly, the last objection is valid. For that one, we agree that bagging clippings for the bit of lawn next to a swimming pool is a good idea. Why Recycle Your Lawn Grass Clippings? 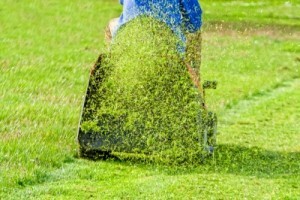 There are plenty of good reasons to leave these nutrient-rich clippings on your freshly mowed lawn. Let’s look at a few of them. Nitrogen! Grass clippings are a rich organic source of nitrogen. In fact, 4 percent of clippings are composed of the nutrient. Regular recycling of clippings can reduce the amount of annual nitrogen fertilizing by one fourth. Three years of recycling can add nearly 2 pounds of nitrogen annually to 1,000 square feet of lawn. Many municipalities no longer pick up grass clippings, because of limited space in landfills. It may surprise you to learn that approximately half the landfills in America ban grass clippings. Well-chopped grass clippings decompose rapidly, usually within a few weeks. Clippings conserve water in two ways: they are 90% water and return moisture to the soil. 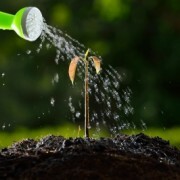 They also add organic material to the soil, which conserves water. According to the University of Idaho College of Agriculture, thatch is “a layer of living and dead organic material that can develop between the true soil surface and the crown or base of the plant…most often caused by over fertilizing and over watering”. It occurs as part of the natural growth process of grass. Grass clippings do not contribute to thatch buildup. A mulching lawnmower has an extra blade designed to chop and grind grass, then disperse the clippings over the lawn. There, they rapidly decompose and return to the soil. But the truth is that you can obtain pretty much the same results with a rotary mower. Cut no more than one-third of the grass blade. Make sure your blade is sharp. Did you know that mower blades should be sharpened at least every second mowing season for bluegrass and annually for fescue or ryegrass? Mow when the grass is dry. Wet grass spreads on the lawn unevenly and can clog your mower. To rid your lawn of matted clippings, rake or use a leaf blower. Another excellent use for grass clippings is as mulch in your garden. Their nitrogen supply also enriches a compost pile. But if you’ve used herbicides or pesticides on your lawn, don’t use your grass as mulch for one month. It could damage your garden’s crops. So if you’re a “grass bagger”, try recycling those clippings. 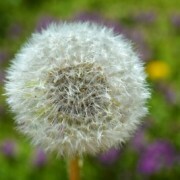 It can help you to have a beautiful lawn and spend less time and money to maintain it.